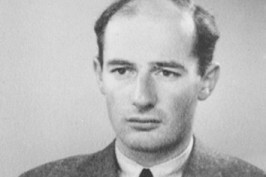 Raoul Wallenberg: Taken by Soviets in 1945 and never seen again. A stretch of 13th Avenue in Borough Park will be co-named Raoul Wallenberg Way on Dec. 9th. Wallenberg was a Swedish diplomat stationed in Budapest who in 1944 saved as many as 100,000 Jews from the Nazis by issuing them documents that afforded them protection from Sweden. The ceremony will be held at 50th Street at noon that day. The change was approved by the City Council in Feburary. The stretch will run from 36th Street to 60th Street, the busiest section of the heavily Orthodox commercial shopping district, lined with dozens of kosher and Sabbath-observant businesses. Greenfield and his colleague, Brad Lander, lobbied the Council’s landmarks committee for the change, together with the Raoul Wallenberg Centennial Celebration Commission, which is marking the diplomat’s 100th birthday this year (He was born August 4, 1912). Wallenberg was detailed by the Soviet Red Army in January, 1945, and believed to have died in July of that year.